It is exciting to see how there are all sorts of casinos opening up all around the world. Some of the latest big casino developments include a number that have been coming about in some of the hottest destinations around the world. However, today’s newest spots for gambling are more than just places that people can head out to when looking to play a game or two. They are spots where there are more appealing things for everyone to enjoy including not only traditional games but also some appealing accommodations, dining spaces and retail sites among other points. The opportunities for such places are endless. With all these points in mind, let’s look at a few of the top casino developments which are popping up all around the world. Such spaces have become big deals in recent time as everyone is looking forward to seeing just where the industry will head into next. Macau has become one of the hottest places for gambling activities in the world. The luxurious autonomous state outside China is home to some of the more luxurious and lavish casinos around. Studio City Macau is expected to be the next big one everyone will be talking about. It has been open for a bit and is anticipated to be all the more appealing to the public as time goes along. The new project in particular is a $3.2 billion effort being run by Melco Crown Entertainment. It is a venture between Melco International and Crown, two separate entities based out of Hong Kong and Australia (Australian casinos on this page). It place opened in 2015 and has a casino spanning about 500,000 square feet of space. It also has two hotel towers with around 1,600 rooms. A Ferris wheel called the Golden Reel is about 130 meters high and is the tallest in the continent. The casino place also has a television recording studio, a 5,000-seat entertainment pavilion and a flight simulator. The simulator features the Batman Dark Flight ride which was engineered by Warner Bros.
MGM Resorts opened this casino in Maryland just on the border with Virginia right outside Washington DC just recently. The place has a casino floor with 135,000 square feet of room with about 3,600 slots and 140 table games. It also has a small theater and hotel tower plus a meeting hall for conventions and other activities. MGM National Harbor cost a little more than a billion dollars to build and hires about 7,000 people at a time. This is one of the more appealing spots around the Washington DC area thanks to its modern look and extensive variety of games. Another place that will open in Macau, Lisboa Palace has been heavily anticipated since ground broke on its site in 2014. This place is slated to open in 2017 and is expected to have not only a massive number of games but also some of the most luxurious accommodations in Macau. The three five-star hotels here include ones that were branded by Versace and Karl Lagerfeld. Each hotel has 270 rooms. The European architecture around the building features an extensive and intricate design that was heavily inspired by many parts of the continent. Details on how much it cost to build the hotel haven’t been released but it is expected that billions of dollars were poured into making this great design work. It all comes with high-end dining and shopping experiences with many brand name labels being hired. The casino is one of the more attractive spaces being promoted for its extensive and detailed look. It has a beautiful style that is unlike what people have seen in other casinos around the world. Wynn Resorts, one of the world’s top entities in live entertainment, has developed this new property top open in 2017. It is just outside the city of Boston and was given the singular license for its particular region of Massachusetts where it is slated to operate in. The site got the license to work in the part of the state just near Boston. The state has licenses that are to be given out only to certain zones around the state. Wynn was able to get to the license for this state sooner than others. The area is anticipated to lead to the development of an entertaining new place in the state. Much of this location has been designed to feature a design similar to what is already used in many of Steve Wynn’s other properties. It has the same curved appearance that other spots have including the primary Wynn located on the Las Vegas Strip. The casino even has a design with a similar color design all the way around. In addition to the traditional table games and slots, there is also going to be a fully dedicated poker room in the area. The Deluxe Resort hotel has more than 600 fancy rooms. Several dining spots are to be included with some of the more prominent ones being Asian-inspired. Thai and Chinese eateries are among the places featured here. A spa and retail center is also to be included in this place. The place is so large that about 15,000 jobs are to be created by the new facility. The powerful efforts used in building here should make for one of the largest spots for people to play games at in all of New England. You can see other US online casinos here. It’s no surprise in how Las Vegas would be the home to one of the top developments around. 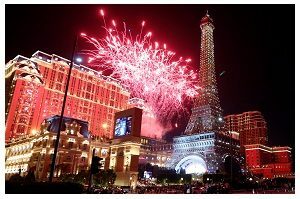 The Genting Group is opening its Resorts World casino on the northern end of the famed Las Vegas Strip. It has an elaborate Chinese theme. The casino is expected to open around 2018. It is one of the largest developments in the city in recent time for how it is for a site that takes up 20 million square feet of space. It has three hotels with 3,500 rooms total. The location houses many entertainment and retail spots and even some authentic Asian eateries. There will even be a panda habitat out here with live panda bears from China being brought out to live here. The large casino floor has a design to take up 100,000 square feet of space. It is expected to produce around 13,000 jobs both at the base location and from other jobs that are produced as a result of the place being open. An interesting part of this project is from how it is being built by a construction firm that has experience with many other casinos from around Asia. Steelman Partners, a group that has built resorts in Manila and Macau among other places, is responsible for building Resorts World. The goal of the firm is to make the site as authentic in its Chinese appearance as possible. The last of the exciting sites to see is the Aquis Great Barrier Reef Resort. It is to be located in Queensland due north of the city of Cairns. It is being built by Aquis Group, a Hong Kong-based firm, and it will cost several billion dollars to produce. The place is currently slated to open to the public in 2018 although the many activities that will be held around here are expected to especially expand over time. There is a potential for this resort to hire at least 50,000 people at some point in the future. The resort area has eight hotels in total. These hotels have about 7,500 total rooms while also housing numerous dining and retail spots. A convention center is to be housed in the middle of the development. A large indoor aquarium is among the attractions to find here. A sports and recreation facility out here includes an 18-hole golf course plus a tennis court and even a full equestrian center. A wildlife and environment conservation area of about 12 million square feet in size will also be added. It will be prepared to ensure that the local plant life in the region will stay protected. The large area is hoping to get at least a million people to visit the area each year. This is a strong goal for a place that is expected to be a massive draw as time goes along. These are all big casino development plans to watch for. These are places that will include some of the most exciting spots for casino gaming and should certainly intrigue anyone in the regions that they are located in. These places certainly will be entertaining to all for their unique styles and exciting places.